A few months back, I had written a post about what had then been, my favourite Easter Egg. I had stumbled upon it quite innocuously - hidden in the Unix terminal behind the facade of command line geekery, and it had blown my mind, simply because of its tenacity and unyielding nature. Since then, I have looked high and low for more of such bits of brilliance, and (I believe) I have finally found the greatest Easter Egg of all time. Being a sci-fi nerd, this was staggering - not just because of how I had overlooked it all these years, but because of its all the epicness that it manages to include in itself. 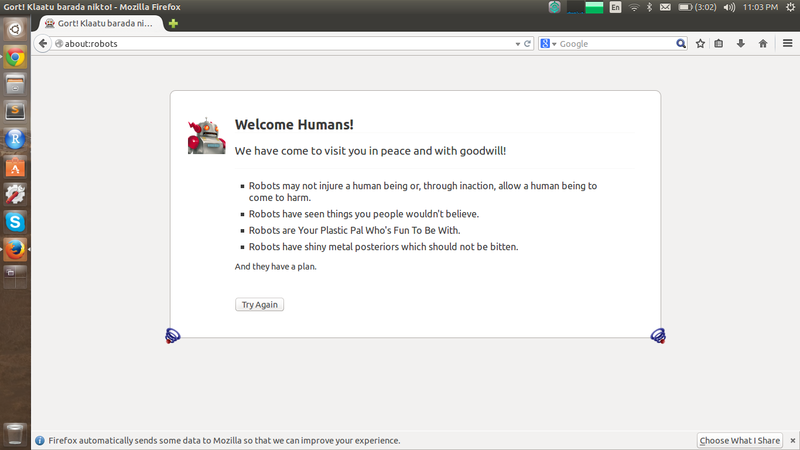 So here's what it is: you fire up Mozilla Firefox, and type about:robots in the address bar. You'll be greeted with a page that looks like this. The “Welcome Humans! We have come to visit you in peace and with goodwill” is followed by references to not one, not two, not even three, and hell - not even four, but five whole references to some of the best robot-themed sci fi that the world has ever seen. The first is “Robots may not injure a human being or, through inaction, allow a human being to come to harm.” which is the First Law of Robotics as postulated by Isaac Asimov of whom I'm a terribly big fan. The second, “Robots have seen things you people wouldn't believe” is a line from the concluding Tears in Rain soliloquy from the film Blade Runner, one of my favourite sci-fi movies of all time. The third that “Robots are Your Plastic Pal Who's Fun To Be With” - is a phrase from Hitchhiker’s (enough has been said about that already). The fourth, which is “Robots have shiny metal posteriors which should not be bitten.” is a quote by Bender Bending Rodríguez from Futurama. The fifth - “And they have a plan” is straight out of the opening credits of Battlestar Galactica. What more, the words that appear on the tab “Gort! Klaatu barada nikto!" are a reference to the 1951 sci-fi film, The Day the Earth Stood Still. I cannot think of a more wholesome Easter Egg. This wins the game. By a huge margin.